Over the past couple of years, I have seen the online Down syndrome community get bigger and bigger. Our very elite "family" has welcomed many more beautiful babies with an extra chromosome, which is so very special. 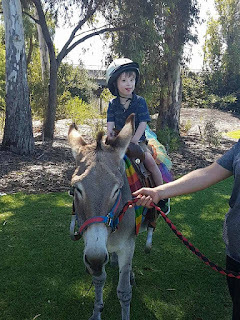 One of the best things about social media is that parents of kids with Down syndrome are now able to connect in a way they never could before. Even when Felix was born (8.5 years ago), I struggled to find others to share my thoughts with. To see that a whole new world has opened up to these new parents is the best!! 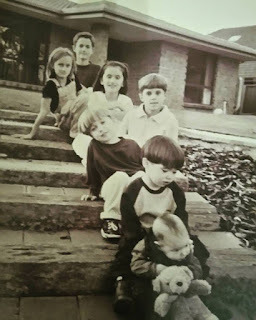 The main reason I began this blog, many years ago, was because I struggled to find any realistic/current information on Down syndrome. 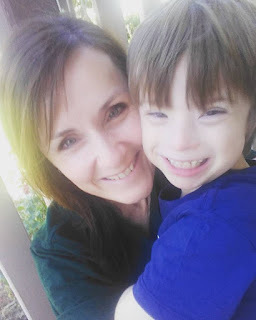 I wanted to know what a day looked like in the life of a family with a child with Trisomy 21. All I could find was outdated information of doom and gloom. How lucky we are that things have changed so quickly over the past few years, and that there are so many great online resources for new parents! 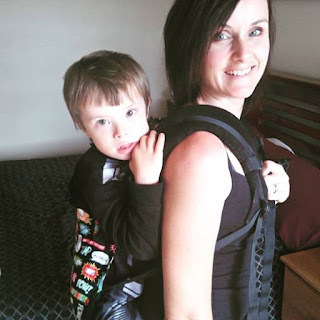 For any new Mums in Australia, check out T21 Mum Australia Network on Facebook. https://www.facebook.com/t21mum/ There are private groups available for Mums with a pre-natal diagnosis or suspected diagnosis, and other groups which correlate with the age of your child. It's a great support network. Make sure you pass on the info to anyone else you know who would love to contact other Mums to share their thoughts and feelings. What does a day in my life look like now that I have a kid, with DS, turning 9 this year?? 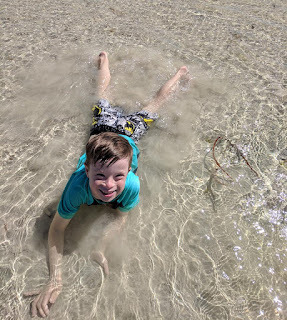 Firstly, let me just freak out slightly that he is turning 9 this year....eeeeeek!! Where did that time go? The biggest news of the past couple of years is that Felix toilet trained, during the day, completely, just after his 7th birthday. After years of gastrointestinal issues which really complicated things, and lots of trial and error with medication and diet, his stomach finally sorted itself out! Around his 8th birthday, he was also completely dry at night. This was a massive hurdle for us, and I am so proud of how well he has done. He has been completely dry at school for almost a year and a half now which is absolutely amazing and, although initially needing reminding, he takes himself to the toilet independently now. Its awesome!! Back to our days... Thankfully, my little early bird is sleeping in these days until 6.30-7am, which my tired old body is very grateful for! I usually hear him in his room, having a chat to his stuffed animals or talking about his friends at school. He's pretty independent from that point on. He gets up and goes to the toilet, then heads out to the lounge room and either takes his iPad off the charger or turns on the TV and starts up the Wii until I get up to make his breakfast. He is WAY more tech savvy than me. Don't ever let him see you put the password into your phone...not even once! Just ask a friend of mine. She turned away for a second and he had unlocked her phone and was sending Snapchats!! Hahaha! I recently made a visual schedule for Felix to use each day. 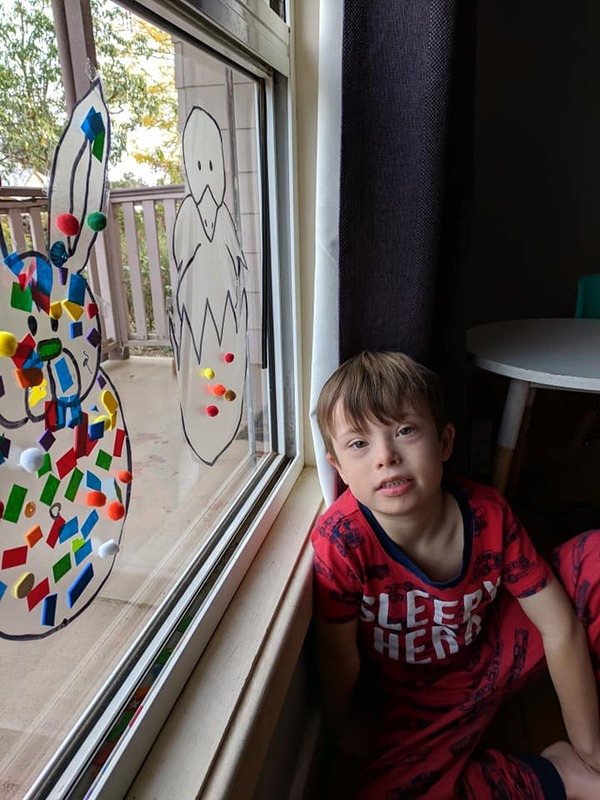 He has a couple of different teachers and support workers during the week, plus therapies etc, and he likes to know what is happening each day. It helps him to know what he needs to organise, and what to expect during the day. He's very adaptable to change, which is awesome, but he's definitely a schedule person just like his Mum! Each night, as we tuck him into bed, we tell him what will be happening the next day. He gets super excited about what tomorrow will bring. He's such a positive little person! Felix loves school, so it's pretty simple to get him ready in the mornings. He doesn't love unpacking his own school bag once he's there though. He would much prefer to help his friends unpack their bags. It's a work in progress, but I appreciate him wanting to be helpful! School hasn't been without it's challenges. With each new year, brings a new teacher, new classroom, new students, different routines and dynamics. First term is always a big adjustment for Felix as he navigates the changes, and builds new relationships. This term has been particularly rough, not helped at all by lots of sickness. I've never seen a class hit by such an awful bug before. It certainly disrupted staff, and students alike! Felix was one of the last to get sick, but once he did, it knocked him around pretty badly. Despite all of that, Felix has done pretty well with his school work. He is concentrating and engaging in his work for longer periods, particularly towards the end of term. He is nearly always keen to complete his homework. I get creative with his spelling word practice, and try to use alternatives to just a pen and paper. We will often write words in chalk on the pavement outside, use a whiteboard, wooden letters or the iPad. His spelling is progressing really well and he still loves to read, which is fantastic. He amazes me with some of the words he can read. Maths homework we do using counters or other visuals. Felix grasps concepts much more easily when he can see them laid out in front of him. Weeknights, after school, are pretty cruisy with Felix. 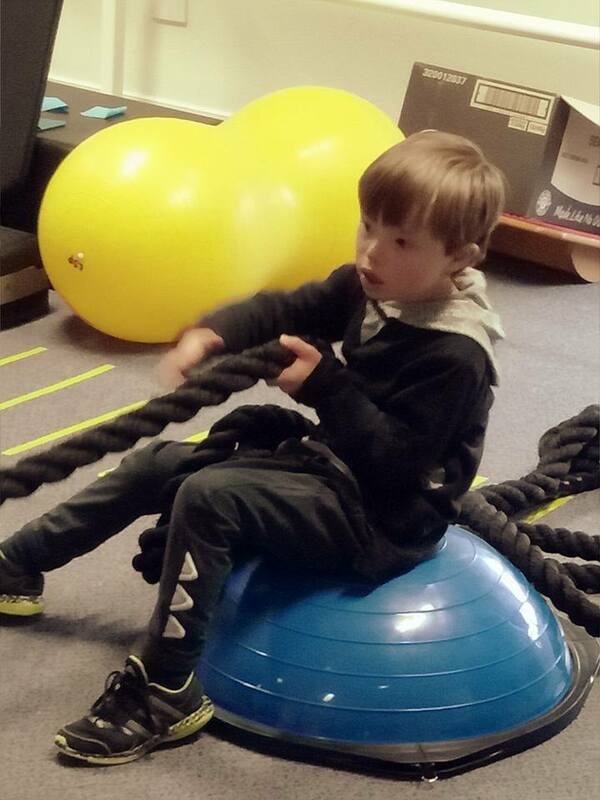 He is usually pretty worn out from school, so he relaxes for a while, playing in his room or watching his iPad. Weekends, and school holidays, are a bit different. Felix is still very active and doesn't like to just sit around, so I need to be one step ahead and have activities planned. I keep his "making box" well and truly stocked so we can do craft. 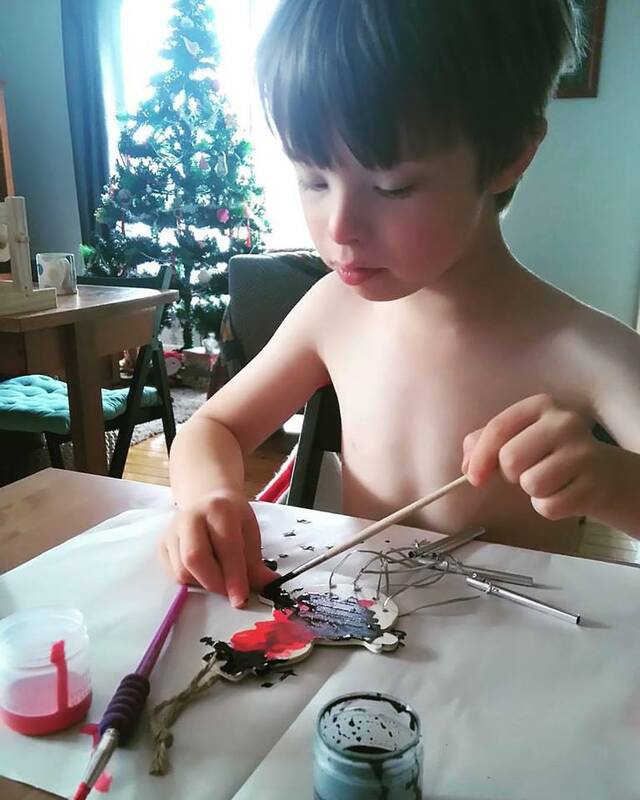 He loves to paint, play with playdough and kinetic sand. He also loves to play games and do puzzles so we have plenty of both. 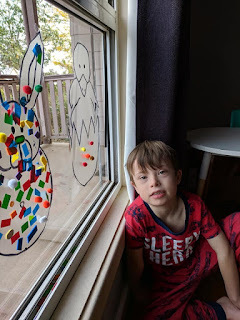 Today I cut out a rabbit and chicken shape out of clear contact and stuck it to the window for him to decorate. He loved it! I try and plan lots of little outings or day trips away to keep him busy and stimulated. An active mind is a healthy mind, so I try to encourage that as much as I can. What else can I say? Felix has impeccable manners, and rarely forgets to say please and thank you. His speech is developing beautifully, and he comes out with the funniest comments and stories. He has a great sense of humour and loves to make us laugh. He still has an amazing gift of empathy and is very sensitive to you if you are having a bad day or are feeling upset. I honestly feel so blessed to have him as part of my life. Actually parenting an 8.5 year old child, with Down syndrome, isn't a lot different to parenting a typical child. In fact, like I have always said, children in general ALL have their challenges. It's a different type of normal. It's certainly our normal now, and I couldn't imagine life any other way! May 1998, I endured a 16.5 hour labour. I had the 'flu, which came with a raging fever, thumping head and pouring nose but, my little bundle decided (at 38weeks), it was time to make his entrance into the world. After 5 easy labours, this one dragged on forever. I was so exhausted after not sleeping for several days, and my body didn't want to play the game. But, eventually, baby number 6 made his way into the world with the loudest cry I think I've ever heard ! He was stunning. An absolutely beautiful looking newborn. I had done it again...or had I? As the months progressed, I began to realise that this baby was quite different from the others. When he cried, it was loud and prolonged. He didn't settle easily to sleep and would often cry for hours until he finally gave in. By about 18 months, the tantrums began. He would bang his head on the side of the cot, or a door, until his head was bright red and sometimes bruised. He made his mouth bleed by slamming it repeatedly on the side of the cot. He didn't do what he was asked, and certainly didn't stop when I counted to 3. He would look me straight in the eye, almost challenging me to see how I would react. Shopping became something I dreaded. I was now the parent who shoved a lollipop into my child's mouth to make him shut up. I was the one who was stared at because my child was laying on the floor of the store, screaming and kicking his legs, refusing to move. 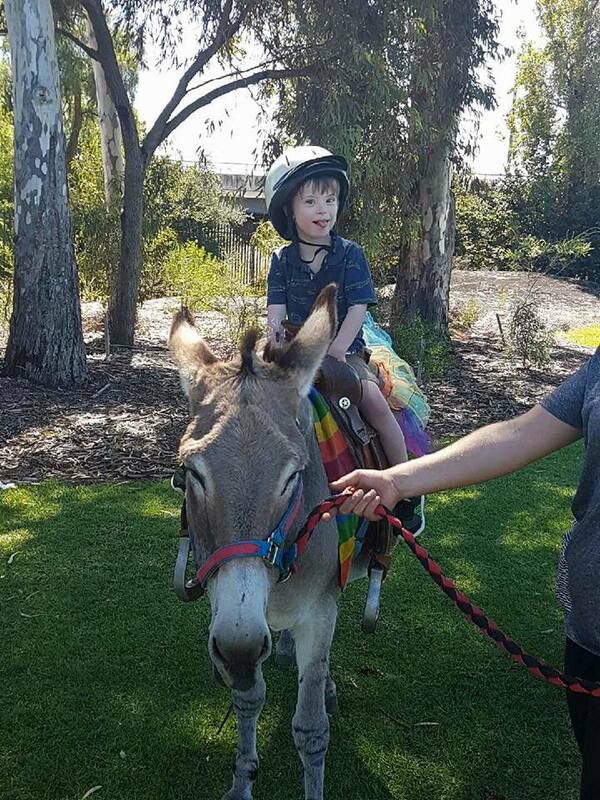 The looks of admiration became condescending stares as people shook their heads at that young girl with ALL THOSE CHILDREN who obviously couldn't cope. I was exhausted and felt completely hopeless. I truly believe I was sent a challenging child to humble me. To show me that sometimes, it doesn't matter how hard you try to do the right thing, things still don't go smoothly. There is no ideal recipe for raising children. Any judgement I previously had, went flying out of the window. I became a person who offered help when I saw another mother struggling with her defiant toddler. I was able to genuinely say, "I know how you feel!" I was able to comfort someone when they burst into tears at the checkout because their child didn't want the pink lolly, they wanted the orange one, and they were letting anyone within a kilometre radius know about it. I felt empathy for other parents, and I am so thankful that my own struggles, and sense of failure, helped me to feel that. It helped to strengthen me and give me a resilience I hadn't had before. It made me a better listener, seeking advice from others, and it developed a deep compassion in me for others who were doing it tough. Preparation for having a child with a disability maybe? Things have been a little challenging with Felix lately. He has moments where he will grab another child (often around the neck), or exhibit other anti-social behaviours. Without him having the speech to be able to explain why he is doing this, we (parents, teachers, therapists, support workers) can only observe the circumstances surrounding these incidents and try and work out what is triggering these behaviours. He LOVES his friends and, it has been observed by everybody, that 99% of the time, he doesn't seem to be lashing out with an angry intent but, more so, to get a reaction. It has been observed that Felix will grab another student if he is overly excited or stimulated. He might begin to play wrestle with some of his friends but then doesn't know when to stop, and can't read social cues. He has also done it when he feels he is being ignored or left out. If he is having issues with his bowel (sometimes he still only manages a #2 once a week), he will get more and more agitated with each passing day, and his behaviour goes down hill. He is not able to tell anyone if he is feeling upset, alone, excited or in pain, but he can express himself by grabbing someone else. Definitely not the ideal as it results in upset kids, angry parents and stressed out staff members, and leaves us feeling helpless and at a complete and utter loss. Thankfully, the school is willing to ride it out with us, and are doing everything they can to stay one step ahead of him. This brings me to last weekend. 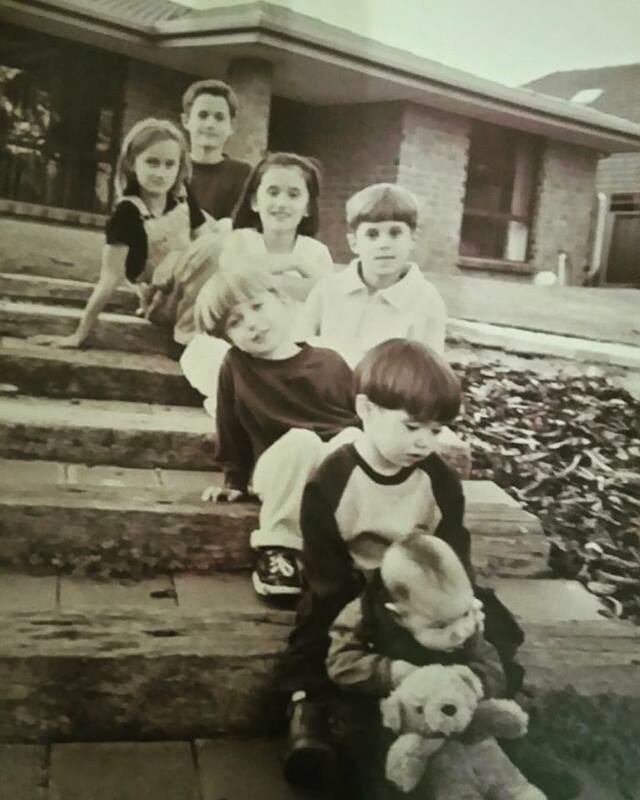 We were visiting family, including three of our Grandchildren (ages 5, 5 and 1.) Felix had been happily playing on the McDonalds playground with them, and a few other children, and they were all having a great time. I had been in the playground with them, enjoying watching them have fun. After a bit of time, I went back into the dining room (I could still see them), to finish my cup of tea. 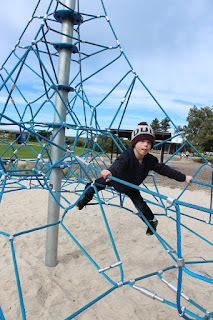 In the next couple of minutes, the playground filled up with a lot more children and I briefly lost sight of Felix. What followed was a blur. A woman approached our table asking if the little boy (described what he was wearing) belonged to one of us. 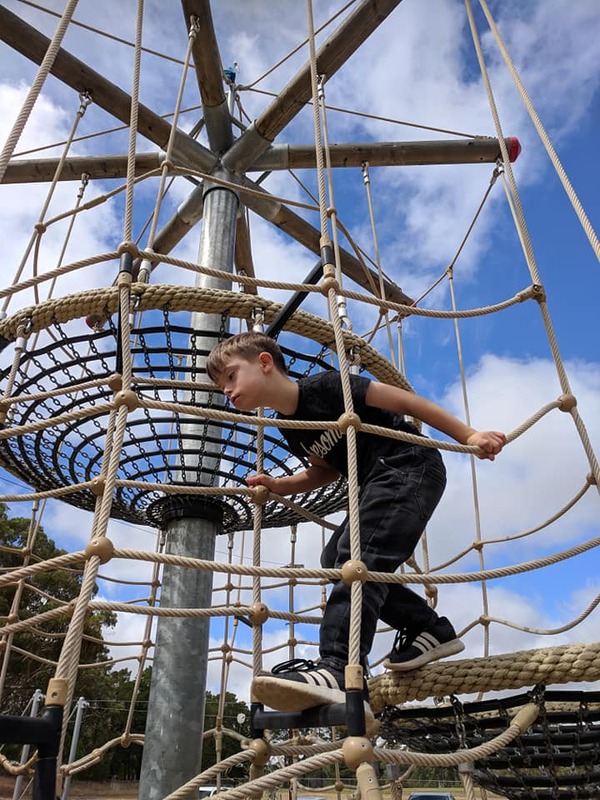 I immediately jumped up to go back into the playground. As I walked in, the woman started screaming at me that Felix had grabbed her daughter (he had let go by this stage.) 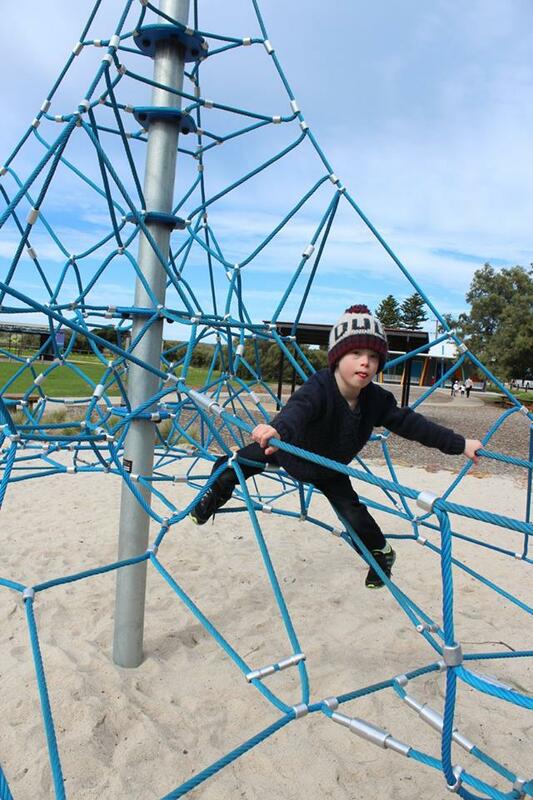 I apologised, and started to climb the playground to bring him back to the table with me. She continued to scream at me.... yelling abuse towards Felix, and causing a huge scene. I apologised again and calmly explained that he had a disability and he had probably felt a bit overwhelmed by the sudden influx of children. That escalated her even more as she berated me for leaving him unsupervised, and told me he needed to know his behaviour was unacceptable. I explained that, once I got to him, he would be told off and asked to apologise. She didn't stop and, unfortunately, Felix slid down the slide just as I got to the top of the playground, and landed right at the feet of the lady. She leaned over and screamed in his face. He looked absolutely terrified. I finally managed to step in between them, told Felix he had done the wrong thing, and took him over to the little girl to say sorry. I'd like to say the woman calmed down, but she didn't. She continued screaming and shouting. Even as we left the playground, she was still shouting over my head to her husband, explaining to him what had happened. Her husband smiled at me and told me it was OK when I apologised. I guessed by his reaction that it wasn't the first time he had witnessed her behave like that. I returned to the dining room, sat for a second, and burst into tears. I scooped up Felix and took him to the car where I sat and sobbed, ugly gut wrenching tears, for about twenty minutes. The next day, Felix's behaviour was worse than it's ever been. He was unsettled, teary, and testing the boundaries at every opportunity. It was easy to see that what had happened had completely unnerved him and he didn't know how to express it. I have finally stopped shaking but the whole situation has completely shattered my confidence. I feel anxious and know that I'm really going to have to dig deep before I feel that I can take Felix out again. I have really struggled with anger towards this woman. Although Felix did the wrong thing, it wasn't any different to things that happen in playgrounds every day. I've seen Felix get pushed and shoved, and dragged around by the collar of his shirt. He was always going to be disciplined and made to say sorry. I always follow through and make sure he's aware that that type of behaviour is unacceptable. I guess my reason for writing this blog post is partly cathartic. It helps me work through things by writing them down in words. More so than that, I just want to challenge people to think about the way they react to things. Do you, like me in the early days, look at people struggling with children with challenging behaviours and think, "Thank goodness that's not me." 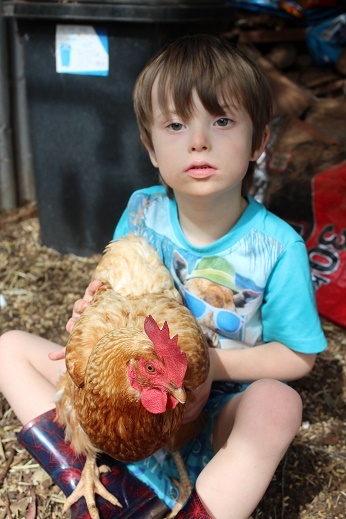 Do you respond in anger, or disgust, and assume that the child is just "feral" or the parents are obviously useless? My plea to you is that the next time you see a child acting out, or a parent fighting back tears, that you put yourself in that person's shoes; that you offer a smile or ask if you can help in any way. Look beyond what you can see with your eyes, and show compassion. I know how something as simple as a smile from a stranger has helped me through some really difficult days of parenting. For me.... I'm trying to feel compassion towards the woman who yelled at me, and my son, on the weekend. Maybe she was having a difficult day with her own children. Maybe she had something awful happening in her own personal life. I will never know. I will, however, take it as a reminder to myself, to be kind, to be considerate, to look at the bigger picture, and to continue to try and show compassion to those I encounter in my life. 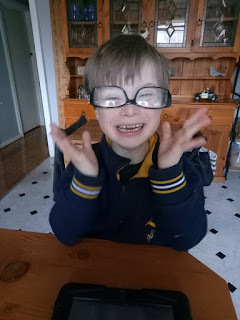 Another year has rolled by and, here we are, celebrating World Down Syndrome Day again! 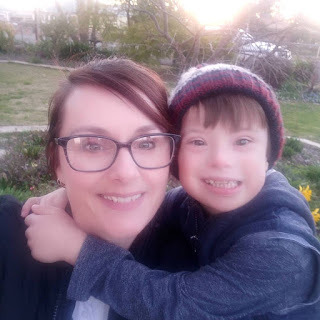 Why celebrate World Down Syndrome Day? 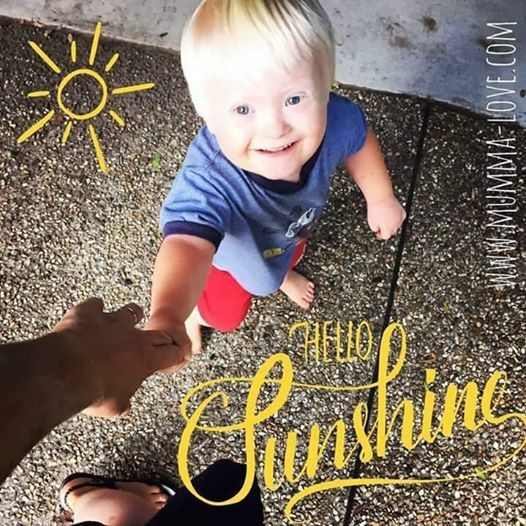 When your child is diagnosed with Down syndrome, there are parts of your life that change forever. You are thrust into a world of medical appointments, therapies, advocating, researching, and days when you are on an emotional rollercoaster which would rival any theme park ride. It can be tough. There are days when you feel resentful; not of your child, but of the diagnosis that has robbed them of their health and their acceptance by society. There are days when you are angry at people's ignorance, and furious at the stares and the pointing as you walk through a shopping centre. There are days when you want to cry. No..... there are days when you DO cry, because you feel overwhelmed. You are tired of the appointments. Tired of the phone calls you have to make to get the support you need for your child. Tired of feeling like the neuro-typical people in the world do not understand your child or your life. And there are days when you are just plain sad, because people don't see your child through the same eyes you do. They don't see their beauty, their spirit, and the wonderful things they can offer the world. 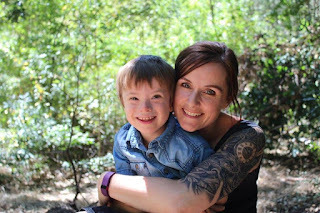 Since I knew of Felix's diagnosis, half way through my pregnancy, I changed. I began to see life differently to the way I had seen it before. I started to see how precious life really was. Felix's life, outside of my womb, wasn't guaranteed. We were told "This isn't going to end happily." He was expected to pass away before he even took his first breath. Each day from that point on, although tainted with grief, was a gift. I celebrated each movement and kick. I got pregnancy photos taken, and some amazing friends booked a 4D scan so we would have as many photos of our little man's face to remember him by if he passed. 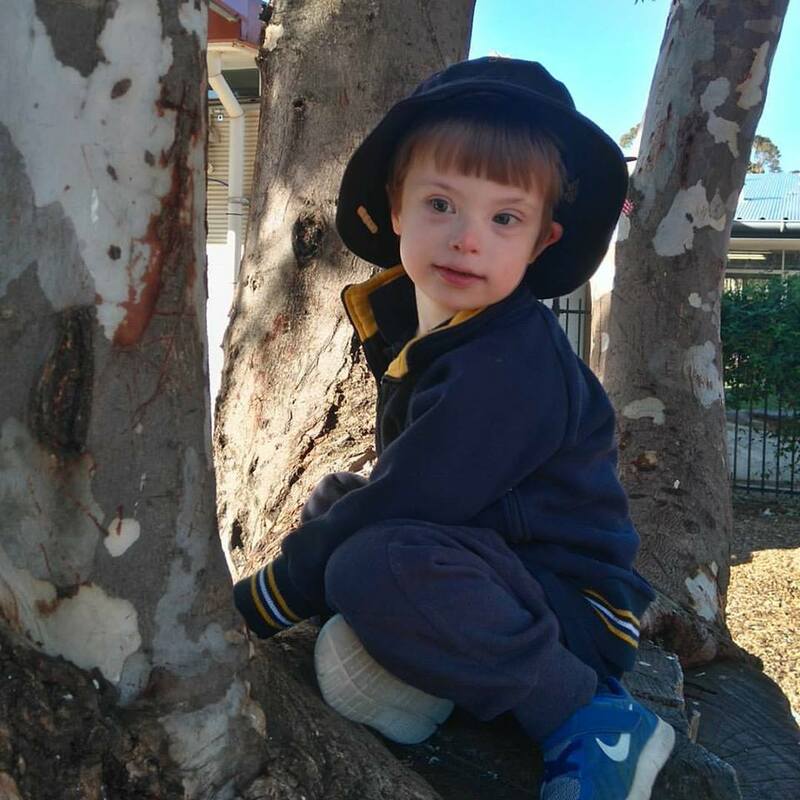 A diagnosis of Down syndrome, at that point, became irrelevant. I was in love with my baby just as I was with my babies before him. The love was just as strong even though he wasn't "perfect" in the eyes of the world. In fact, I felt a fierce protectiveness over him that I had never felt before. 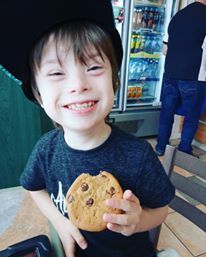 My love for Felix was strong during my pregnancy but, when I laid eyes on that little face and saw those facial characteristics, so typical of a baby with Down syndrome, that love grew and filled my heart so much it could have burst. Nothing has changed in the past six and a half years. Felix has taught me to embrace life, to take risks, to love deeper, to be patient, to slow down, and to laugh more. More than anything, he has taught me to laugh. Not a day goes by that Felix doesn't make me laugh. He is so intuitive, and is so empathetic if someone is feeling sad or low. One smile, or funny comment from Felix, and I feel better. He loves life, and that love is infectious. He jumps in puddles, he lets the sand run through his fingers, he notices the tiny bugs in the garden. If the moon is visible in the sky, during the daytime, he will show me. He loves his family and his friends and loves nothing more than giving huge hugs. If Felix loves you, and you don't like anyone in your personal space, he will rectify that really fast! 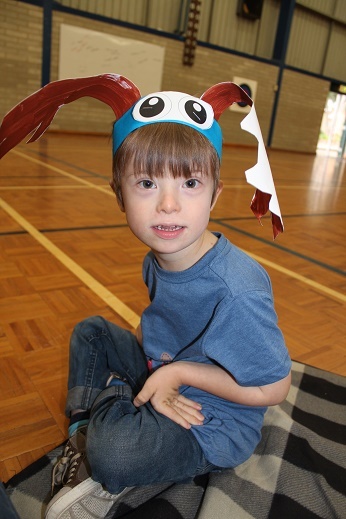 So, why celebrate World Down Syndrome Day? For me, it's a day that celebrates love. It's a day when I take some time out to reflect on how Down syndrome has impacted on my life. It's a day to celebrate diversity and the lessons we can all learn from people whose paths are different to our own. It's a day to recognise ability, and the fact that people with Down syndrome are capable of incredible things. It's a day for me to be thankful for the people I have met because of a tiny little chromosome. These people have become such an important part of my life, I can't even remember what life was like without them. It's a day to be thankful for the family and friends who are a constant support to me, and love Felix unconditionally. It takes a village to raise a child, and Felix's village is doing a fantastic job! 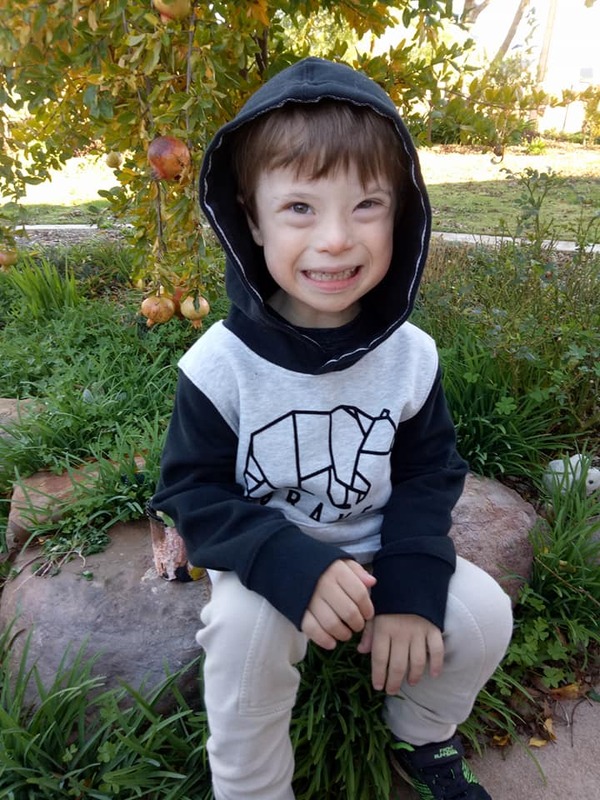 More than anything, World Down Syndrome Day is a day to celebrate Felix's life; the life of a six year old boy who loves to play in the dirt, and climb anything and everything. A boy who is obsessed with the alphabet and loves to read. 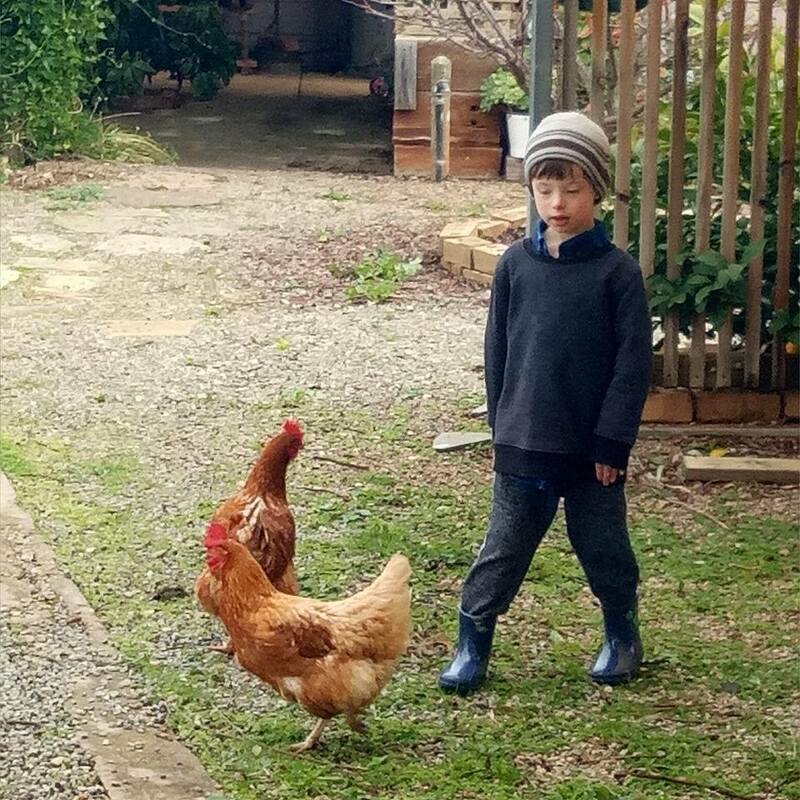 A boy who loves to collect the eggs from his chooks and throw them some grain. A kid who has an amazing sense of humour, and laughs harder than anyone else at his own jokes. 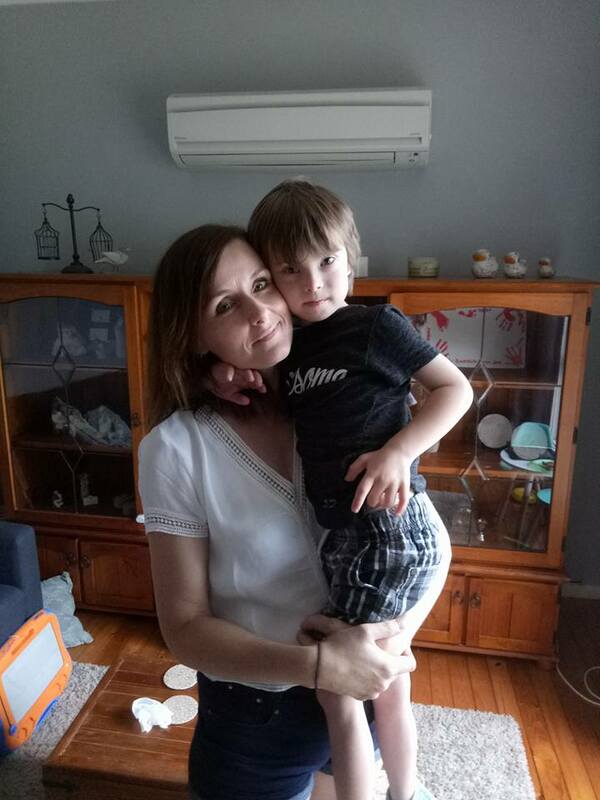 A little boy who is so polite, he even says thank you to the Doctor after a blood test, even after yelling "stop please" when the needle went in. A little boy who loves to rough house and sometimes gets a bit carried away and has to be told off. A kid who can make his own sandwich and can make me the best cup of tea. A kid who is excited to go to school, every single day, and even asks to go on the weekends. A kid who chose me to be his Mummy. I will be forever grateful! Happy World Down Syndrome Day! In my last blog I talked about the things we did with Felix to encourage his speech, in preparation for learning to read. In this one, I'll tell you what practical steps we took to teach him to read. The first thing I did, was to get some advice from a couple of people who have been working with individuals, with Down syndrome, for over twenty years. These ladies have seen what works and what doesn't work with our kids and understand the way they learn which, generally for kids with Down syndrome, is very visual. After talking to them, I invested in a laminator, started up the printer, and made sure I had plenty of photo paper and ink. Start small! Choose four things your child loves. Don't try and pick simple words, like cat and hat, just because you think they will be easy to learn. If your child doesn't have a cat and hates wearing hats, those words won't really be relatable to them. Your words could be "dinosaur", "fire engine", "Sampson" (pet dog), and "Mum". Make sure, however, that your child can say, or sign, the words you choose so they don't become frustrated. Next, print up a photo of each word you've chosen (and laminate it for longevity), and print up the word in a simple font in a decent size. 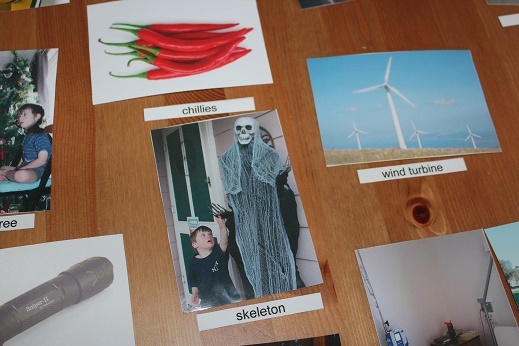 Once that's done, choose two of the words initially, and show your child which word belongs to which photo. After they have seen you match them up a couple of times, give them the words and tell them it's their turn. If they don't get them right, don't say "no" or tell them off, just say, "I think they might go here", and put the words under the correct photo. Don't make your child sit for longer than they want to. You want it to be fun. If you see them getting bored, finish up and try again another time. They will probably only want to sit for a couple of minutes initially. Once they are matching the words to the two photos easily, change it up. Put the words down first, and get them to put the picture next to the correct word. If that's too easy, see if they can tell you what the words are without the photos. When they are 100% correct every time with the two words, add another two, so they're matching four, and so on. Always make sure they know them perfectly before you add more. If frustration creeps in, and you get annoyed with them for taking to long to learn it, they will lose interest, and you'll be back to square one again. Each child is different, so I can only speak from my experience with Felix, but he absolutely blew me away with how quickly he learnt to recognise sight words this way. There were days when he would sit and persist for ages and ages, and we were sometimes able to get 10+ new words in a day. His memory for visuals is incredible! Once he started being able to read the words without the photo prompts, we saturated him with the words in other forms. We wrote them on blackboards for him to read. We painted words and wrote words in different colours on paper. We used alphabet letters to spell out the words. In no time at all, he was writing the words himself, or spelling them out with letter cards or alphabet puzzle pieces. The visual thing is quite interesting. If I ask Felix to spell "zebra", he will say "z...e....b...". then, if he can't remember the next letter, he closes his eyes and writes it in the air with his finger "z...e...b...," then opens his eyes and shouts out "R" then says the "a." It's like he actually has to close his eyes to see the sight word in his head, and then is able to spell it out loud. About 98% of the time, he is able to remind himself this way, and spell the word correctly. 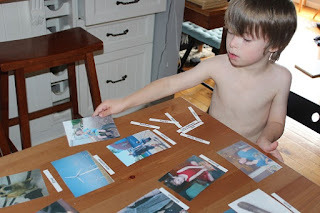 Felix now has a huge sight word vocab, and doesn't need photos when we introduce new words anymore. 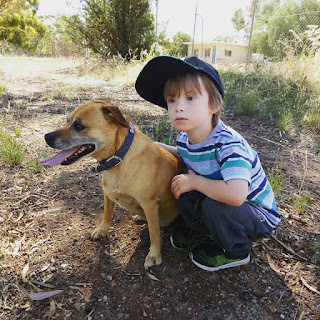 Repetition seems to be enough for him now, so he has been able to use the Oxford sight word list, exactly the same as the other kids in his class at school and is keeping up with the typical kids his age. We still need to make sure we put in extra time with him because, obviously, he needs a bit of extra time for comprehension and actually speaking the word isn't always easy for him. It's funny how he can read better than he can actually speak. He can read the sentence, "Mum, could you come into the kitchen please? ", but if he was asking me that in every day life, he would just say, "Mum, come here please." Another thing I have found works well to help Felix speak a word properly, is to get him to look at my mouth while I say it, and then get him to repeat it back to me. After I have done that several times, he usually manages to say it consistently. His speech still has a long way to go, and his reading, especially comprehension, will be a work in progress for many years to come but, I'm so super proud of my little guy. His persistence and eagerness to learn is so beautiful to watch. It can be exhausting sometimes, and there are days when I would love nothing more than for him to sit and watch a movie for a couple of hours to give me a break but, I know this stage won't last forever, so I'll enjoy it while his mind is a little sponge, soaking everything up! 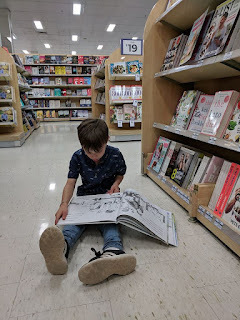 Recently, I have had a couple of people ask me if I have done a blog post on how I have taught Felix to read so I thought I'd put it in writing for anyone who is interested. I'll do it in two parts; the first being speech, and the second being reading. Firstly, I just want to say that I am not a teacher. I don't claim to be an expert on teaching a child to read. The following is just my own personal experience with Felix and what has worked for us. Secondly, every child is different. Some kids love to read, and others hate it. Each of our 8 kids have all been keen readers but we had no TV in the house for years so reading was the alternative for them. My kids have all had some friends who were never interested in reading, but excelled in other areas instead. Similarly, I have adult friends who only read when they absolutely have to. If your child is not interested in reading, even after trying everything, you're not doing anything wrong. It may not be their cup of tea..... but they will get it eventually! We were lucky enough to have a pre-natal diagnosis with Felix. I say lucky because it meant we were able to make plans, research, ask questions, and have conversations about things we wanted to put into place for him. We knew the sky would be the limit for him but, initially, we focussed on the basics. 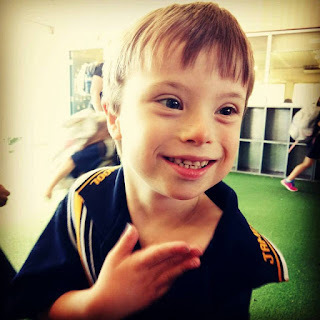 We wanted him to be able to walk, talk, read, write, be kind and loving, and have beautiful manners. I'm proud to say, that at six years old, he has accomplished all of those things. 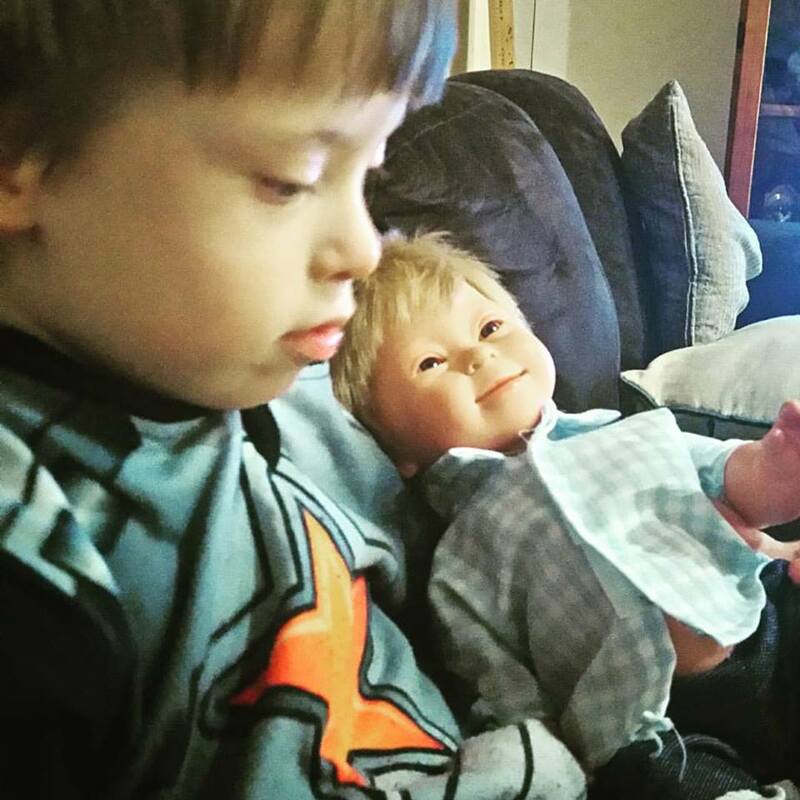 Initially, during my pregnancy, I read up on breastfeeding a baby with Down syndrome. Breastfeeding helps with tongue control and mouth placement so, it was important to me in those pre-speech days, to get him off to the best start by breastfeeding him if I was able to. Breastfeeding him was definitely not easy, and I'm thankful I had 7 successfully breastfed babies under my belt to give me some experience. I persisted, and fed him until he was 18 months, when he weaned himself. Sign language has been discovered to be very beneficial in developing speech, contrary to the outdated view that using signs will make your child become lazy and refuse to speak. We started signing with Felix when he was only a few months old. By 8 months old, he used his first sign, and we were amazed at how quickly he picked them up. Even though he didn't use verbal speech until around 4 years of age, from 12 months onward, he could sign more words than typical kids would have been able to speak at the same age. I even insisted he sign "please" and "thank you" years before he could speak the words, which was pretty adorable! Adult speech during play was so important in developing Felix's speech and vocabulary. If I stacked 5 blocks, I would count them... 1,2,3,4,5. I would talk about putting the red block on top of the blue block, or putting the triangle next to the rectangle. When we were driving in the car, I would point out the blue sky or the big green tree. I felt it was important to surround him with language, and use the correct words for things. A sheep was never a "baa baa", it was always a sheep. A baby was never a "bubba", it was a baby. I pointed out words on signs and tried to make him aware of his surroundings by showing him traffic lights, and planes in the sky. Recently, a little voice in the back seat of my car said, "Mum! Stop! Look for trains!" He was pointing down a side road. Sure enough, the sign, just before the train line, said Stop, look for trains! Felix's ipad was a pivotal part of his speech and language development. He got it just after his second birthday and, up until recently, it has always only had educational apps on it. I can honestly say that the ipad apps taught him so many things way before I even thought about teaching them to him. I remember being blown away that he knew all of his colours (and I mean ALL....even grey and silver!) It was the same for shapes. I know adults (myself included) who couldn't tell you what a trapezoid is, but he nails it every time! All because of using the educational apps on the ipad on our long drives to the city. I figure, if he's going to be using an electronic device, he may as well be learning from it. Being our first baby in a very long time, and an extra special one at that, I tried to focus on buying him toys and puzzles with some sort of educational value; cause and effect, shape sorting, matching etc. With a bit of luck, those were actually the things he was naturally drawn to, and he developed a love for letters and numbers very early on. From birth, he had a whole wall covered in alphabet letters and he was fascinated by them. I think all of these things combined, contributed to his speech development, and ultimately his ability to recognise letters and read. 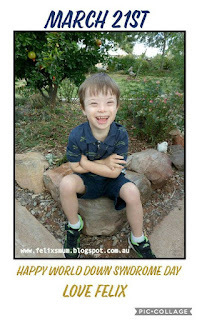 Felix has had a Speech Pathologist off and on since he was tiny. To be honest, these have been very hit and miss for us. I would say, for the first 3 years of his life, his speech therapy was a bit of a waste of time, as his therapists were very new to the job and none had ever worked with a child with Down syndrome before. Recently, however, we have found an amazing speechie who visits Felix at school, and works with him there. She goes out of her way to go the extra mile for him and she has fantastic suggestions, which she regularly communicates to us. Felix loves her! I could go on and on, but that is a basic overview of Felix's speech development and the things I think have helped us get to the stage we're at now. Good luck to those of you walking a similar path at the moment. There will be times of discouragement, and days when your child doesn't seem to be making any progress at all. Those months and years waiting to hear that first word can be agony. I've been there many times in the past 6 years and I'm under no illusions that I won't shed many tears in the years to come. Hang in there....our kids are so worth all the hard work!! 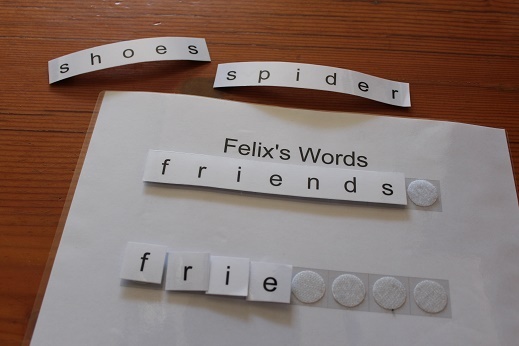 In my next blog, I'll talk about some of the practical things we have done to teach Felix to read. I'm still not feeling able to write that much after the sadness of this week. 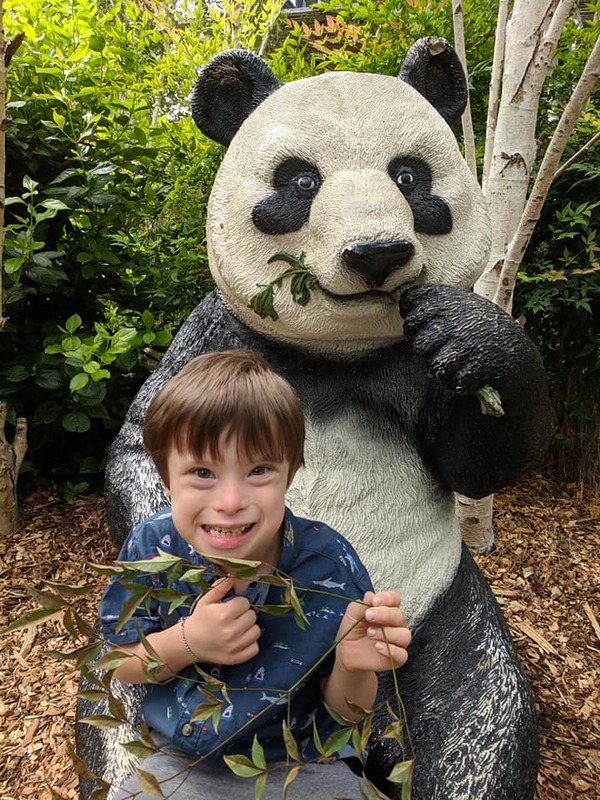 I have tried to write another blog but my mind is a bit jumbled and all over the place but, I did think of one really beautiful little moment with Felix, yesterday, that I would like to share. It was that time of night when, after a day at work, you look in the fridge and think, "What can I cook for dinner?" The uninspiring contents of my fridge stared back at me so, I decided to bundle Felix up into the car, and go to the supermarket for more inspiration. It was still daylight when we arrived at the shop. Felix, as per usual, made a short trip to the shop slightly longer than necessary. In the trolley. Out of the trolley. Running up the aisle. Choosing things from the shelf and putting them in the trolley. Me, placing said items back on the shelf. Helping to put the shopping on to the check out. Finding the ride on car and sitting in it. Wanting to unlock the car himself. Escaping my clutches and climbing over the seat into the front. Me, wrestling him back into his car seat and strapping him in. You get the picture? Lucky he's cute! When we got home, it was dark. I was tired and in a hurry to make dinner and get it over with. Felix, being the chilled out little guy that he is, wasn't in a rush at all. He got out of the car, gazed at the sky and said, "Sun all gone!" I stopped, realising this was one of those moments when Felix was reminding me to slow down, and replied, "Yes Felix. The sun has gone to sleep now. Can you see the moon?" We both stood on the front lawn looking up but couldn't find the moon. Felix pointed and said, "Stars!" I nodded and mumbled something about there being lots of stars, and started to move towards the house with my shopping bags. When I got to the front porch I turned around and saw that Felix hadn't moved. He was still craning his neck; his face looking up to the sky. The next moment was so beautiful. He started to sing Twinkle, Twinkle Little Star. He didn't look at me. He kept his eyes on the stars. The most special bit for me was that he spoke the words in the song more clearly than ever before, and didn't stop gazing up until the whole song was finished. It melted my heart to watch him and, all the stress I was feeling up until that point, disappeared. As usual, the little guy worked his magic and filled my heart. He always knows just what I need! The newest little star in the sky! I have felt so many mixed emotions this week. I have felt so much sadness and cried many tears. I have felt angry that a precious little man was taken from such a beautiful family. I have felt joy as I've watched Felix play, and I've laughed at the funny things he's said and done. I've also been frightened about his health. To be honest, I have been terrified about it. Nicholas, like Felix, had always been really healthy. None of us are promised a tomorrow, so it's another reminder to live each day fully and love deeply. More than anything this week, I have held Felix tighter than I have in a very long time. 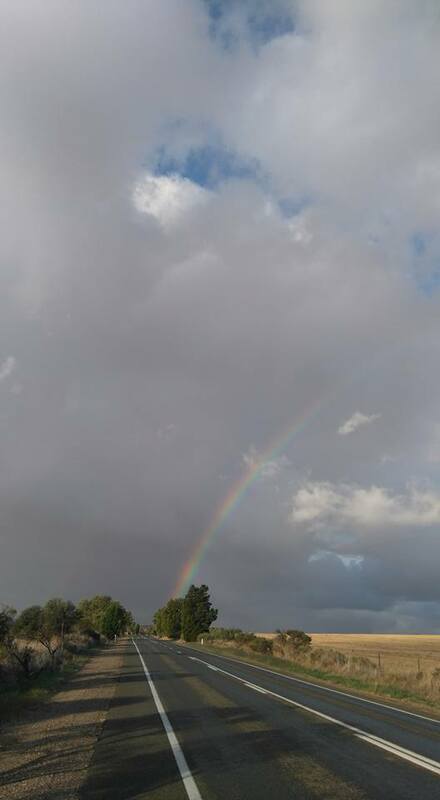 Yesterday, as I was driving home from work, I saw a huge rainbow in the sky. The longer I drove, the bigger it got until I could see the whole arc from one side to the other. I stopped the car several times to take photos of it. Some of you might remember my rainbow story. After we were told, at the hospital, that Felix probably wouldn't survive, and was likely to pass away in the womb from issues with his brain, we saw a rainbow on the way home that day. Every fortnight, after that, as we drove 200km to the hospital for appointments, we saw another one. Seeing the rainbow brought me a peace that Felix was going to be OK. Ever since then, a rainbow makes me think of Felix. After a radio interview I did, a few years back, they played the song "Somewhere Over the Rainbow". When Felix graduated from kindy last year, what song came on as his face appeared on the power point presentation? Yep...."Somewhere Over the Rainbow". I'm a proud Mum to 8 amazing children, here on earth, and a 9th beautiful angel in heaven. My youngest son, Felix, has Down syndrome. I am passionate about raising awareness, and increasing acceptance of people with Down syndrome. I feel privileged to have Felix in my life and have learned, and am continuing to learn, so much from this incredible little person.